Save the date…Feb. 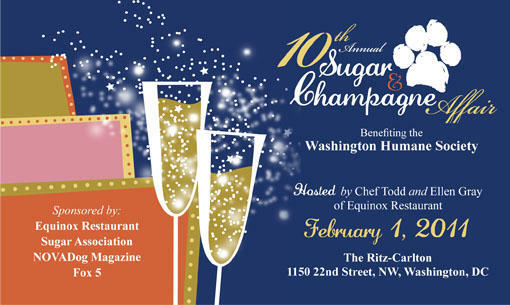 1 is the 10th annual Sugar & Champagne Affair to benefit the Washington Humane Society. What better way to beat the winter blahs than heading over to the Ritz Carlton on 22nd St. NW to sample dishes from Chef Todd and Ellen Gray of Equinox restaurant. Best of all — leashed dogs are welcome and encouraged to attend! The event honors the Washington Humane Society’s Humane Law Enforcement Officers, Animal Control Officers, and Humane Educators. To date, more than 60 local restaurants and beverage companies are participating. Tickets are $150 for the VIP tasting room from 6:00 p.m. to 7:30 p.m., featuring food from restaurants including The Source (where President Obama took Michele for her birthday dinner last week), Bourbon Steak, and Restaurant Eve. $90 gets you and your pooch into the general reception from 7:00 to 9:00 p.m. There will be a silent auction and a Doggie Bar courtesy of Barkely Square.